That’s the trend among some competition anglers. So, I’m fiddling with new and thinner Euronymphing leader formulas (at the bottom of this post). A thinner/lighter leader ups a rig’s sensitivity and lets you fish better smaller flies due to less drag. All this can lead to more fish and bigger fish. George Daniel suggested at his clinic that we all go thinner with our leaders. He shared what rigs he and others are fishing these days. Fellow blog writer Damon Matus was at the session and said that a thinner set-up was a game changer for him. “A thinner leader gives better drifts, especially on longer casts. ‘Thicker’ casts light rigs for distance easier, but sags more. Thick line also throws a dry okay when needed, but if you go too thin, you cannot. The thicker line weighs more, and combined with a long, soft-tipped Euro rod it is able to load/flex the rod tip and cast the virtually weightless dry fly. In other words, there is no perfect set-up. I’ve found that Euronymphing leaders are all about trade-offs. It is a quest for perfection, that interminable search for the right leader for the conditions you face on that day. 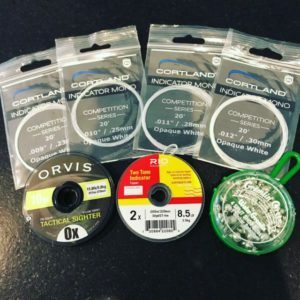 So, after emailing with Zach St. Amand, Torrey and Damon and doing some online-research, I ordered some new materials: Orvis Tactial Sighter 0x, Rio Indicator Tippet 2x, and a variety of Cortland Indicator Mono in white for stealth. Heck, I threw in some split-shot, too, to experiment with drop-shot rigs. I now have a good pile of materials after six years of playing with Euronymphing leaders. Yes, it can get out of hand! I really love my “regular” Euronymphing leader: I can short-line, long-line, “float the sighter” at shallow water and throw dries. I have been happy with the results. But, I think it is time for a change. Now, you may ask: Why bother? Great question. “I mix it up,” he said. George fishes with different anglers, such as Torrey and Zach, when he is on the road. He said that he always learns something new, and all that keeps things fun and engaging. So, I’ve resolved to mix it up, too. Time to go down a new rabbit hole! I would think that a short leader, attached to the tippet ring above your sighter after removing the sighter and tippet would allow you to cast drys. Me, I’m too lazy and carry a short, cheap 4wt for drys. Toss it in the bushes and its there when I need it. I think you nailed it, Steve. 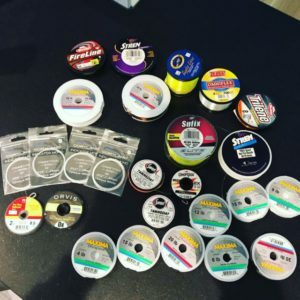 I’ll first go to dry dropper if possible but if serious dry fly fishing is what you want, you’re either changing the whole leader, switching reels, or carrying a second rod. You might struggle through it with the mono rig, but it’s tough. At that point, it’s a matter of the angler and what he’s most likely to do. Having a second rod handy is ideal. I ran into Maxima tippet in Scotland. I reaalllllly like using it. in a 5x size for nearly anything for trout. Even in 8lb size for a chunk to toss streamers it, seams really good. Gotta check it out. Have only used Maxima to build leaders up until the terminal section. Strong stuff! Nothing to do with leaders. The Swift was stocked pretty heavily today above and below Rt 9. Let the games begin! I’m still 95% Farmington and Deerfield, but do think the Pipe area can be special once brookie eggs are in the drift. Thanks for the heads-up. I was wondering if you ended up experimenting with a drop-shot rig and, if so, what your sense of its effectiveness is. It works well under certain conditions, namely slower and deeper water.